The interconnected actions of the auditory and vestibular systems have a major role to play in the coordination of movement and balance, which in turn impact brain function. The function of the ear is to feel and hear sounds and movement. 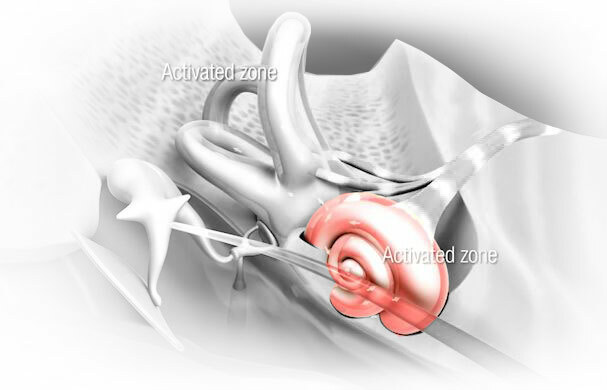 It is referred to as the vestibular-cochlear system. The ear is not only an auditory organ which perceives sounds but also a motor organ which captures our movements and determines our balance, rhythm and coordination. Try covering an ear while walking and you will see that you will suffer significant loss of balance. The auditory part of the inner ear is the Cochlea. The motor part is the vestibular system. The Cochlea Organ is deeply involved in speech processing and musical analysis. It looks like a snail covered withof cells inside and arranged from the lowest to the highest pitch. Almost 80% of the total length is devoted to the reception and analysis of high frequencies (from 800 HZ and above). The fact that Because a huge proportion of cells are dedicated to perceivinge high frequencies, this explains why those frequency sounds provide more stimulation to the brain than lower frequency ones. Because the Patented Dynamic Filter effect of SOUNDSORY® favors high frequencies, the brain is progressively learning how to process those important frequencies and get the most from of this stimulation. The Vestibular system is strongly involved in posture and balance as well as muscle tone, coordination, sense of rhythm, body schema, spatial navigation, integration of the two body sides, and motor planning. The vestibular system is in charge of detecting changes of movements at the level of the body in order to enable constant postural readjustments. It is composed of the saccule, utricle, and the three semicircular canals. The utricle and saccule are sensitive to changes of movements in a straight line. The semicircular canals are sensitive to changes of movement in rotation. The vestibular system is highly sensitive to rhythm and movement. It is the organ which makes us move our feet, hips, hands, and head spontaneously when we listen to our favorite feel-good-song. The music of SOUNDSORY® is specifically designed to be dynamic and emphasize rhythm. It provides strong vestibular stimulation. The impact is strengthened by the bone conduction technology implemented into SOUNDSORY®. Indeed, the vestibular system captures the rhythm of sounds directly through this vibration of the bones, which stimulates it more effectively than air conducted sound.